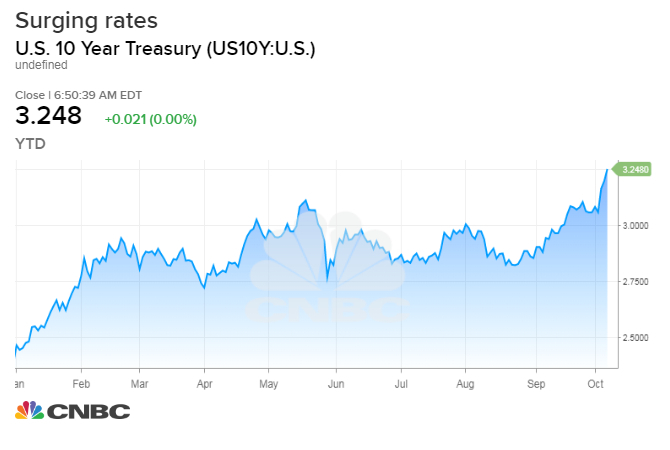 The yield on the benchmark 10-year Treasury note rose above 3.25 percent in early trading, returning to levels not seen in more than seven years. The 10-year yield is up more than 20 basis points over the last week amid a report showed the lowest U.S. unemployment rate in 49 years and rising wages. "We haven't seen the uptick in inflation that would normally fuel a backup in the back end of the curve, but the market may be thinking it's only a matter of time," said RBC's Craig Bishop. Concerns surrounding rising interest rates again took center stage after U.S. government debt yields hit highs not seen in several years on Tuesday. The yield on the benchmark 10-year Treasury note rose above 3.25 percent in early trading, returning to its highest level since 2011. The yield on the 30-year Treasury bond rose above 3.43 percent, its highest level since 2014. As of the latest reading, the 10-year note yield slipped lower to 3.2 percent while the 30-year dipped to 3.36 percent at 3:06 p.m. ET. Bond yields move inversely to prices. The U.S. bond market was closed on Monday for observance of Columbus Day. Bond experts have pointed to the robust economic data, signs of inflation and a glut of debt issuance as a reason for the rising rates. The 10-year Treasury yield has climbed more than 20 basis points over the last seven days amid a report Friday which showed the lowest unemployment rate in 49 years, along with rising wages. The report adds to the now-widespread view that the labor market is near or beyond full employment and shows wages are starting to accelerate higher. This could be a worry for the Federal Reserve trying to keep a lid on inflation. Still, some explicit reads on inflation, such as the personal consumption expenditures (PCE) price index, have yet to take off as quickly as some central bankers expected. "We haven't seen the uptick in inflation that would normally fuel a backup in the back end of the curve, but the market may be thinking it's only a matter of time," said Craig Bishop, vice president of U.S. fixed income at RBC Wealth Management. The Fed announced its third quarter-point increase to the federal funds rate in September. "If you go back to the September FOMC meeting — and subsequent comments from Fed officials — it all combines to send a message that a December hike is on the table," Bishop added. "There's even some question as we look ahead if we're going to get four hikes in 2019." The S&P 500 hasn't posted a single positive day since Wednesday as investors fear rates are rising too far, too fast, threatening to derail the economy. Attractive yields can also push investors away from the riskier equity market and into the relatively benign Treasury market. "Conventional wisdom holds that rising rates threaten equity valuations. ... The question, then, is at what point rising rates become a burden," wrote Jonathan Golub, chief equity strategist at Credit Suisse. The Treasury Department is set to auction $36 billion in three-year notes and $23 billion in 10-year notes on Wednesday; it is slated sell $15 billion in 30-year bonds on Thursday. The U.S. government's decision to cut taxes and increase spending over the past year is fueling an economy as a deluge of debt issuance from the Treasury Department hits the markets. In its quarterly refunding statement in August, the Treasury said it will be adding another $1 billion a month to each of the auctions for two-, three- and five-year notes over the next three months. The moves came as the government scrambles to handle a budget deficit expected to eclipse $1 trillion in the next two years. The national debt is at $21.6 trillion, having risen about $1.1 trillion in 2018. Key inflation data, including the producer price and consumer price indexes are due Wednesday and Thursday, respectively. — CNBC's Silvia Amaro contributed reporting.